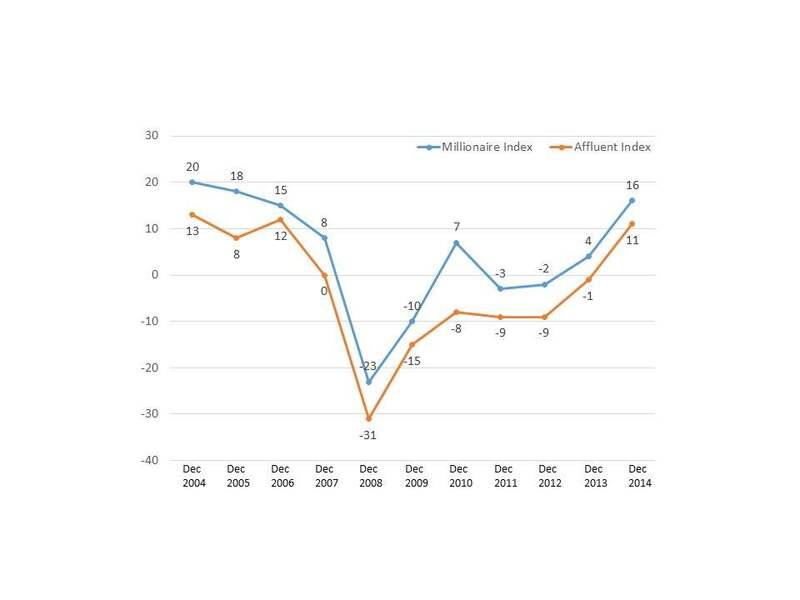 Over the past decade, the Spectrem Affluent Investor Confidence Index and the Spectrem Millionaire Investor Confidence Index have served as a reflector of Affluent investment behavior as well as their economic concerns. The past year ended with the SAICI and the SMICI at three-month highs with readings of 11 and 16, respectively. The indices, established in 2004, measure the investment confidence and outlook of households with more than $500,000 of investable assets and more than $1 million of investable assets, respectively. The December SAICI and SMICI were up 12 points each from the same period last year, an indication that Affluent households overall have a positive mindset about the present and future financial situation. The indices have yet to return to levels reached in the years leading up to the economic collapse. In December 2004, the SAICI was at 13, while the SMICI was at 20. By the end of 2007, the year the housing bubble burst, they had dropped to 0 and 8, respectively. Both plummeted in 2008. By December of that year, they were at -31 and -23, respectively. They provided another snapshot of the improving Affluent investor mindset in 2009—the year the recession was officially declared ended--when the indices while still in negative territory, were trending upward (-15, -10). The indices each ended the year in negative territory through 2012. During this period, concerns over the economy were exacerbated by partisan divide and government gridlock, a parmount concern of Affluent investors, Millionaire Corner research finds. Last year, for example, the SAICI dipped from 1 in November to -1 in December, while the SMICI fell from 10 to 4. During this time, lawmakers were at loggerheads over sequestration and initially unable to reach an accord leading up to the deadline that would trigger mandatory spending cuts. Not coincidentally, during this time, there was a jump in Millionaire and non-Millionaire investors who indicated that they would hold on the sidelines rather than invest, which is another factor that has historically dragged on the indices. With the Republicans taking control of the House and Senate and looming debates over the Keystone pipeline, immigration and healthcare, it will be interesting to see how the Spectrem indices react in their second decade.